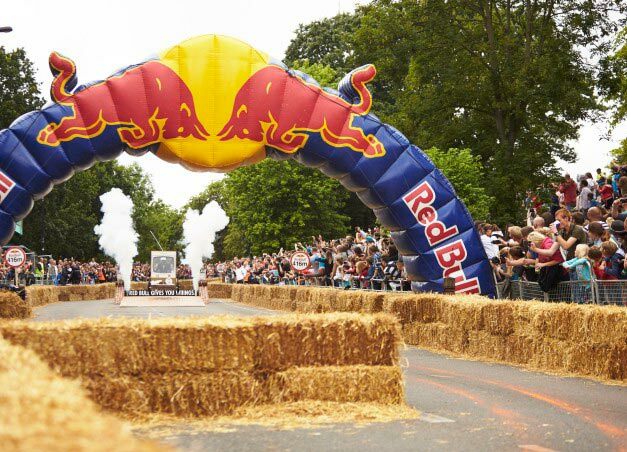 Red Bull Soapbox race returns to Alexandra Palace Sunday July 7th 2019. Sign up closes 1st March 2019. Full Application must be submitted by 24th March 2019 via Red Bull Website or posted to Red Bull Race Control, Seven Dials Warehouse, 42-56 Earlham Street, London, WC2H 9LA, United Kingdom. Teams will be announced 15th April 2019. Red Bull Soapbox Race is an international event in which amateur drivers race home-made soapbox vehicles. Each hand-made machine is fuelled by nothing but sheer courage, the force of gravity and perhaps a little Red Bull. This unique, non-motorised racing event challenges both experienced racers and amateurs alike to design and build outrageous soapbox dream machines and compete against the clock in a downhill race. Red Bull has held more than forty soapbox races around the world since the first one in Brussels in the year 2000 – from Australia to South Africa, Helsinki to St. Louis, Jamaica to Italy. Over the years, vehicles have ranged from realistic replicas to anything the imagination can conjure up. Previous designs have included a piano, a giant baby carriage, a rodeo clown, a massive corn on the cob, a jail cell and the Golden Gate Bridge.